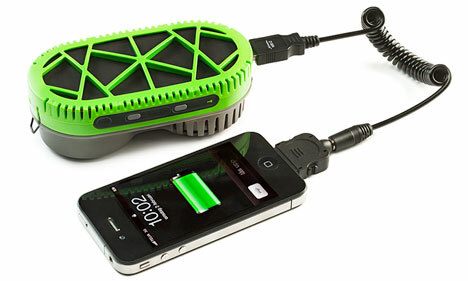 The PowerTrekk charger is made by Swedish firm MyFuelCell and incorporates a small replaceable hydrogen fuel cell (PowerPukk). Once primed with a tablespoon of water it will charge a smart phone, digital camera, GPS, or any other gadget that can be recharged via a USB cable. There are many solar chargers on the market, but unlike them, PowerTrekk is not reliant on hours of sunshine. It is activated as you turn it on. The only by-product to be emitted is water vapour. The actual PowerPukk fuel cell is safe enough to be permitted as part of aircraft cabin baggage. 2. business people in remote locations away from powerpoint recharge facilities. 3. people who expect to find themselves in emergency conditions when normal electrical power is not available. The rated output of the PowerTrekk is 5V, 1000 mA. Power can also be stored in the onboard 1600 mAh lithium ion battery if not used immediately. The PowerTrekk costs around � 148 in Europe, with the little replaceable PowerPukks being about � 0.80.